Sara Ryan has had an exciting start to her career. Last year she released her debut single Belle, which won “Best Newcomer” and “Best New Single” on Dublin City FM. And to top the year off, she was crowned New Folk Artist of the Year at the Irish Folk Music Awards, alongside Damien Dempsey, Johnny McEvoy, The Druids and Aoife Scott. The Kildare-born songwriter, now based in Cork City, built a strong and loyal following supporting prestigious acts such as Mick Flannery, Martin Harley, John Spillane, Wally Page, Luka Bloom, Ye Vagabonds, Andy Irvine and Cry Monster Cry. Sara is now based in Cork City, She has become familiar with audiences within Cork City and national venues also. 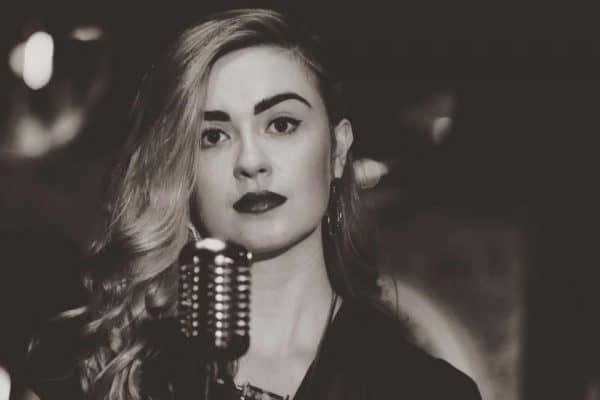 In recent years Sara has been performing in various venues such as The Cavern Club, Liverpool, Whelan’s, Dublin, The White Horse Sessions in Kennys of Lahinch, Coughlan’s, Cork and The White Horse, Ballincollig, as well as various venues in Cork City and County. Ryan was listed as a woman who has made a contribution to Cork’s musical history on Hot Press Magazine. 2018 sees the release of her second single Euphoric Recall on February 23rd and Sara’s much anticipated Debut EP Glitter Skies will be released this coming March. With a performance style compared to a young Edith Piaf, this summer 2018, Sara will continue grace stages across Ireland and share her songs and stories throughout our Emerald Isle. Sara Ryan brings a unique voice to the Irish music scene with memorable lyrics conveying stories as real as they are raw. 2018 is the year the world will discover this wonderful voice. “I’ve known Sara since childhood.Its been a joy to witness her young career, to hear her songwriting develop and her singing mature.This young lady has a huge career ahead of her.” – Christy Moore. Jan 2018.